What role do human rights play in the development of regional organizations? What human rights obligations do states assume upon joining regional bodies? 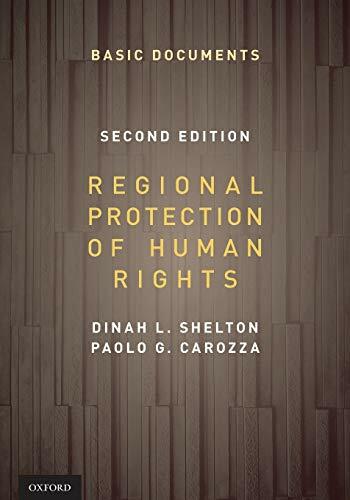 Regional Protection of Human Rights, Second Edition is the first text of its kind devoted to the European, Inter-American and African systems for the protection of human rights. It illustrates how international human rights law is interpreted and implemented across international organizations and offers examples of political, economic, social problems and legal issues to emphasize the significant impact of international human rights law institutions on the constitutions, law, policies, and societies of different regions. Regional Protection of Human Rights provides readers with access to the basic documents of each legal system and their inter-relationships, enabling readers to apply those documents to ever-changing global situations, and alerting them to the dynamic nature of regional human rights law and institutions. The jurisprudence of the European and Inter-American Courts and decisions of the Inter-American and African Commissions are emphasized, including decisions on the interpretation and application of various human rights, procedural requirements and remedies. Prospects for regional systems in the Middle East and Asia are also discussed. The relevant basic texts are reproduced in a documentary supplement. Together, Regional Protection of Human Rights and its accompanying Documentary Supplement provide comprehensive access to the basic documents of each legal system and their inter-relationships, enabling readers to apply those documents to ever-changing global situations, and alerting them to the dynamic nature of regional human rights law and institutions. In addition to serving as a text for courses on human rights law, the book will be useful for courses in international law, international relations, and political science. It is also be a helpful resource for lawyers and policy-makers concerned with the protection of human rights. Dinah L. Shelton is the Manatt/Ahn Professor of International Law at George Washington University Law School. She is the author of three prize-winning books, and has also authored many other articles and books on international law, human rights law, and international environmental law. Professor Shelton is a member of the board of editors of the American Journal of International Law and is a vice-president of the American Society of International Law. She serves on the boards and as a legal consultant to many human rights and environmental organizations. Professor Shelton was elected to the Inter- American Commission of Human Rights in June 2009. In 2013 Dinah Shelton was awarded Goler T. Butcher Medal for outstanding contributions to the development or effective realization of international human rights law. Paolo G. Carozza is Professor of Law at the University of Notre Dame and an expert is in the areas of comparative law, human rights, and international law. From 2006 to 2010 he was a member of the Inter-American Commission on Human Rights and served as its President in 2008-09. At Notre Dame, he is the Director of the Kellogg Institute for international Studies, an interdisciplinary, university-wide institute focusing primarily on the themes of democracy and human development. In the Law School, he is Director of the Center for Civil and Human Rights, including its J.S.D. program in international human rights law, and the Director of the Law School's Program on Law and Human Development. He is also a fellow of the Kroc Institute for International Peace Studies and of the Nanovic Institute for European Studies. He has taught at several universities in Europe and Latin America and has been a Visiting Professor at Harvard Law School. Shelton, Dinah/ Carozza, Paolo G.